The WSC 2016 is over. I have a lot of puzzles left to solve, but I’m quite happy with my result (54th in the general ranking, after the 39th official participant, after 89/63 last year). Here’s a puzzle I made to help Martin to prepare to become the King of the Mountains (not sure that helped, considering I didn’t quite have the rules right). 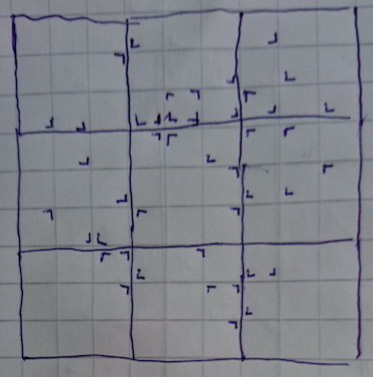 Test-solved by the new world champion Tiit Vunk of Estonia. Congratulations to both! Rules Fill the cells with numbers 1 to 9, so that no number repeats in a row, column or outlined 3×3 square. Whenever a number is equal to the sum of some numbers in a diagonal direction, an arrow is placed pointing there. This entry was posted in Puzzles and tagged medium, sudoku, twin-detector sudoku on 2016-10-19 by rob. We’re running a small preview series on croco-puzzle for the 2016 WSC and WPC, which will take place in Slovakia soon. 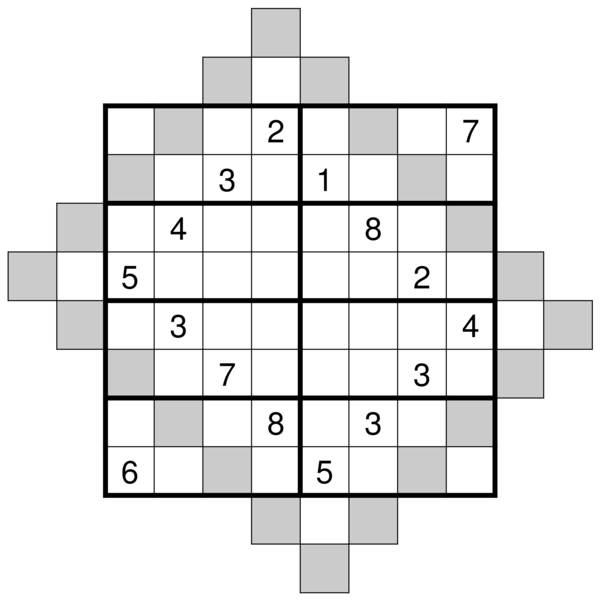 We’ll kick it off with an External Sudoku tomorrow. 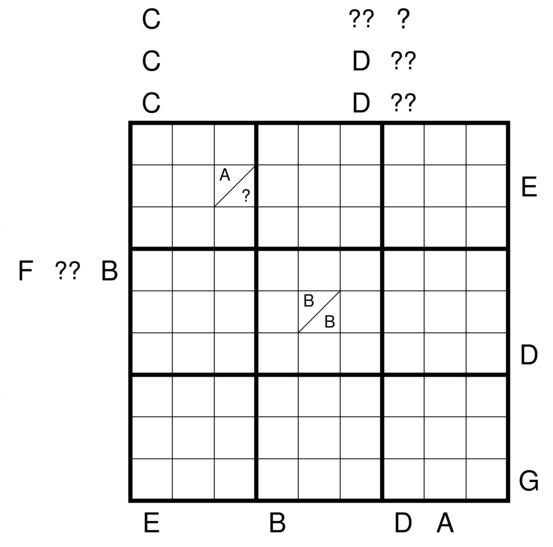 For this, I made an example puzzle which seems worth posting in its own right. 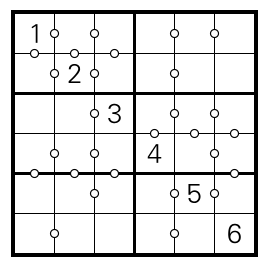 Rules Solve as a standard Sudoku, i.e., fill the grid with numbers 1-8 such that every row, column and outlined area contains each digit exactly once. 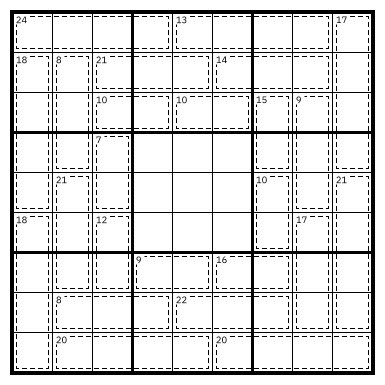 In addition, there is a diagonal rectangle of gray cells. Every edge of this rectangle must contain exactly the digits 1-(length of the edge). 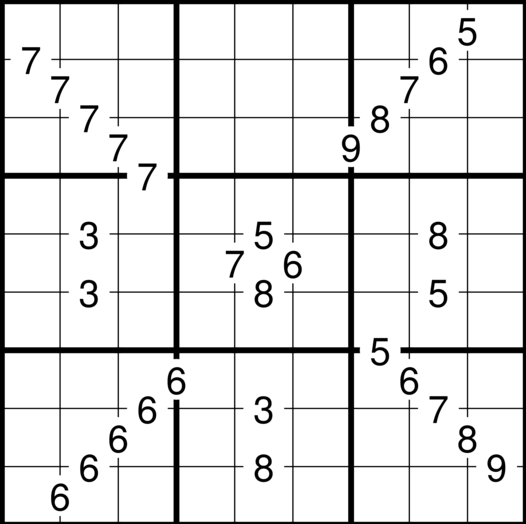 Diagonally adjacent digits in gray cells must not be consecutive. This entry was posted in Puzzles and tagged external, medium, sudoku, variant on 2016-10-03 by rob.